After returning from Cape Verde and holiday I caught a lovely dose of cold on the plane me thinks. This laid me low for a couple of weeks. I did manage a few visits to the river. Neil Maidment kindly invited me to fish the river Frome in Dorset. I was going to try and catch a few grayling from this short but fantastic river. Alas the rain from the previous couple of days coloured the river up and so we were fish blind. It was unfortunate as I really wanted to see this chalk stream in all it’s winter beauty. It’s a funny old world I bumped into my friend Archie Pike on the banks and we both agreed great minds think alike. I reminisced the fact that 2 years ago to almost the date we bumped into each other in Cape Verde 2500 miles away and fished together for the week. Archie had not caught a grayling before and today he landed 3 with the largest going 1lb 10oz. So a great start for him. Neil faired a little better with a few small dace and grayling and sea trout. All I got for my efforts was a trout of a very good size jumped 3 times and on the last one the hooklink broke. 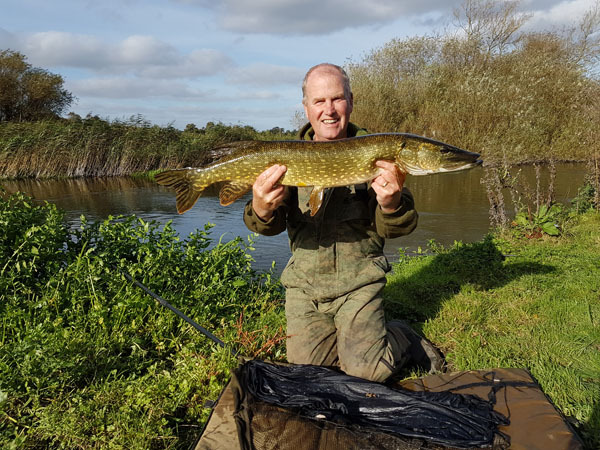 Neil is a top float angler and does particularly well on the Stour. So thanks a million Neil and we will have a day on the H.Avon later in the year. I had a very short session on the H.Avon fishing for pike with a lure. The river was low and clear, not ideal however I still managed 3 with the largest just over 9lbs. 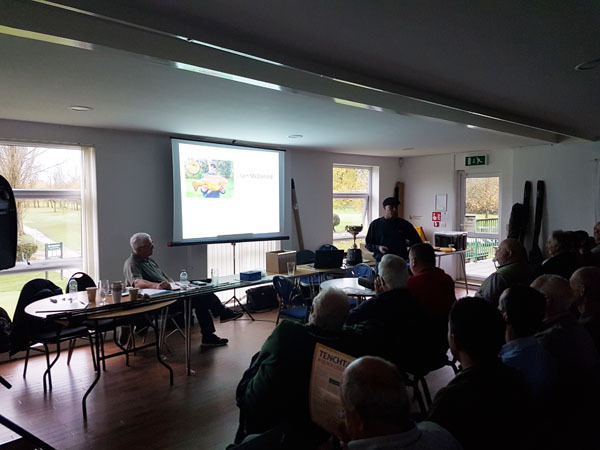 In the middle of the month (November) I went to Milton Keynes for the Tench fishers AGM which as normal was excellently run. It is always great to catch up with the best group of lads I know. This year there was another good attendance of about 90 or so. We were very fortunate to have Iain McDonald the Drennan cup winner for 2017 giving the talk. What fascinated us was that he lives in Kent and fishes the lakes and river close by. What is even more staggering is that he cycles for his fishing. What a great talk and some brilliant photo’s too. Well done you have one more admirer on your style and mode of transport of your angling. Top bloke!!! Then there came the raffle prize. I won a couple of hand built Harrison 11ft Avon rods. Beautiful rods. Then came the special prize for the Golden Ticket on the Medway Valley Fisheries which I only had my ticket drawn out. What a prize indeed. I’m sure I’m going to put this to good use next season. I only hope that my dreams come true. This entry was posted on Monday, November 27th, 2017 at 8:56 pm	and is filed under Uncategorized. You can follow any responses to this entry through the RSS 2.0 feed. Both comments and pings are currently closed.